I was visiting in this area so we stopped here for lunch. Small room, nicely appointed in minimalist decor. Table seating with waitstaff service. I took a peek at the sushi before I sat down, to see how it looked. Sushi bar very clean and orderly and the fish appeared to be fresh and firm. They offered us a lunch menu as well as their full dinner and special items. Lunch was as expected a few Bento Box offerings, teriyaki, the usual rolls and soup, wonton , miso or hot and sour. I was going for the specials I chose the Miso and the fire belle roll my companion the pacific roll. 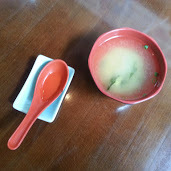 I was not a fan of the miso, it did not taste like any I have tasted in the past so that was sent away. I had a better outcome with the fire bell roll. First the presentation, it was spot on, simple and elegant at the same time. I just wanted to gaze at it sitting there on the table Yellowtail, spicy tuna, cucumbers. I was correct about the fish. Sweet firm to the bite with just enough spice in tuna lets the flavor roll through the mouth. The other roll was even more stunning in presentation. Nested in a bowl like plate the tuna based roll was dressed with a nest of fried onions topped of with flying fish eggs. You know those little red orbs that pop in your mouth. I wanted this for myself. Before we left I made a quick trip into the loo in order to wash my hands. It was like going into a small Zen room. I just stood there to take it all in. Crazy no? Service is good the only down side, only one sushi chef was working on what turned into a very busy lunch. We had time to kill so no issue there, but if you have a time constraints there may be an issue.